A copy of this book was kindly provided to me by Netgalley and Thomas & Mercer in exchange for an honest review. I have read this whole series now which is available on kindleunlimited for free and is worth checking out. You can read these books as stand-alones because each has an individual story line but they are a phenomenal series that do tie together well. I could see these books playing out as a movie or tv series (could be along the lines Criminal Minds or CSI). Part of me wishes the series were more connected because I want to know what happened to everyone from The Butterfly Garden; yet I have been drawn into the world contained in each story The Summer Children especially got my tear ducts working. The beginning of The Summer Children alone caught my attention with a little girl’s description about how she was afraid of the dark because people are more honest in the dark. The illustrative language used leaves you picturing all the tears, insults and abuse that are coming straight for you. This continues throughout the novel not just with the little girl’s description of her fears but with each case Mercedes deals with. 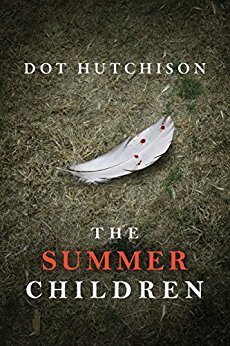 Dot Hutchinson develops characters with real depth and keeps her stories moving so you don’t feel stymied in backstory. There is also a lot of humor between her characters, mostly humor fairly typical to law enforcement, that allows a break from the serious and heartbreaking story. Mercedes is a fantastic character full of depth and realist facets. Her viewpoint gives a stirring look into the life and idiosyncrasies of law enforcement. I have to smirk at the snarky relationship Mercedes and her FBI partner Eddison have, full of bluster, harassment, and complete understanding of each others’ personalities. Yet sign in pleasure at the care they take of each other and all the members of their team. "She said Mercedes would come and I'll be safe." I don’t think anything could get to me as much as those lines. What would a child have to go through to believe the person who violently kills their parents is an angel. This is just the first of many times Mercedes lives out similar scenes on her property, each one heartbreaking and unique. All connected to this mysterious ‘angel’, who by the second case left on Mercedes doorstep I wasn’t sure I wanted caught. This book will tear you apart. It needs to be read.